We understand how difficult it is when patients came to know that child has some speech delay due to some associated speech disorder like Developmental delay, Hearing impairment, Down syndrome, Autism/ADHD, Cerebral palsy etc. That highly interfere daily lifestyle, Academics, Socialization, Relationship, Social negligence and inferiority feeling can be seen in parents. Drspectra offers diagnostics and therapeutic solution which aims to improve the child receptive and expressive language skill rapidly. In diagnostic procedure, we evaluate the speech and language disorder via standard test and equipment. In therapeutic procedure we usually provide complete solution of communication development in term of comprehension and verbal expression in children with delayed speech and language with Down syndrome, Autism/ADHD, developmental delay, Hearing impairment, cochlear implant etc. through medicated therapeutic Speechifi device with practice material under professional services. 30 minute daily practice as prescribed will give speedy improvement in Child Speech and language development. 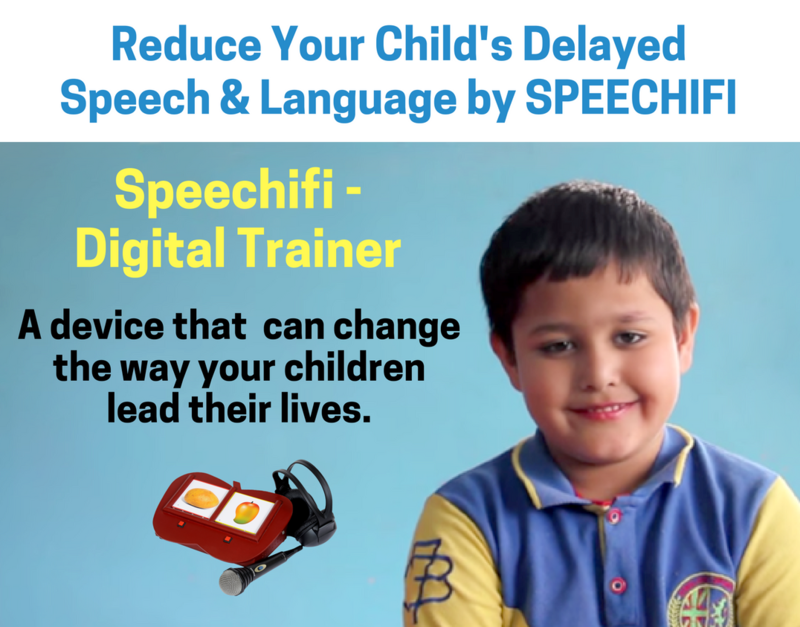 Speechifi device helps to train and stimulate the brain for speedy speech and language development in both clinical and Non-clinical situation. Regular use of this proven medicated therapeutic solution under professional guidance helps in boost confidence and speedy improvement. Results show that the success rate is up to 90%. We are leading solution for such speech and language problem where patient gets instant relief by using the Speechifi device in systematic and effective way. Multimodality approach of speech solution captures child attention and improves sitting, eye contact and verbal expressive language skill of child. Success rate is itself captured by top medical institutions in India. Till now we have data of success stories around 1000+ patients who are using satisfyingly our treatment. We provide a protocol-led treatment plan administered by highly qualified and expert person at your convenience. Join 4 or 5 words together to make short sentences, such as 'want more cookies' or ‘he took my bat’. Use action words as well as nouns, such as ‘run’, ‘fall’, ‘sleep’, ’drink’, etc. Start to use simple plurals by adding‘s’, for example ‘shoes’ or ‘cars’. People that know them can mostly understand them. Most of the sound are clearly articulated. If you feel above following things are not done by your child or lacking somewhere you must consult us as soon as possible. Till the first birthday, babies should be using their voices to relate to their environment. Cooing and babbling are early stages of speech development. Till 9 months, babies begin to string sounds together, use different tones of speech, and say words like "mama" and "dada" (without really understanding what those words mean). Till 12 months of age, babies should also start paying attention to the sound and start recognizing the names of common objects (bottle, etc.). Babies who watch intently but don't react to sound could be showing signs of hearing loss. Kids at this age should have a wide range of speech sounds in their babbling like p, b, m, d, or n. They begin to imitate sounds and words they hear, and often say one or more words (not including "mama" and "dada"). Nouns usually come first, like "baby" and "ball." They also should be able to understand and follow simple one-step directions ("Please give me the toy," etc.). Most (but not all) toddlers can say about 20 words by 18 months and 50 or more words by the time they turn 2. By age of 2, kids starts to combine two words to make simple sentences such as "baby crying" or "Daddy big." A 2-year-old should be able to identify common objects (in person and in pictures); pointing to eyes, ears, or nose when asked; and follow two-step commands ("Please pick up the toy and give it to me," for example). Parents often see huge gain in their child's speech. A toddler's vocabulary should increase to (too many words count) and he or she should routinely combine three or more words into sentences. Comprehension should also increase — by the age of 3, a child should begin to understand what it means to "put it on the table" or "put it under the bed." Kids also should begin to identify colors and understand descriptive concepts (for example big versus little). Why choose our speech and language development service? What is the treatment of delayed speech and language in Drspectra? 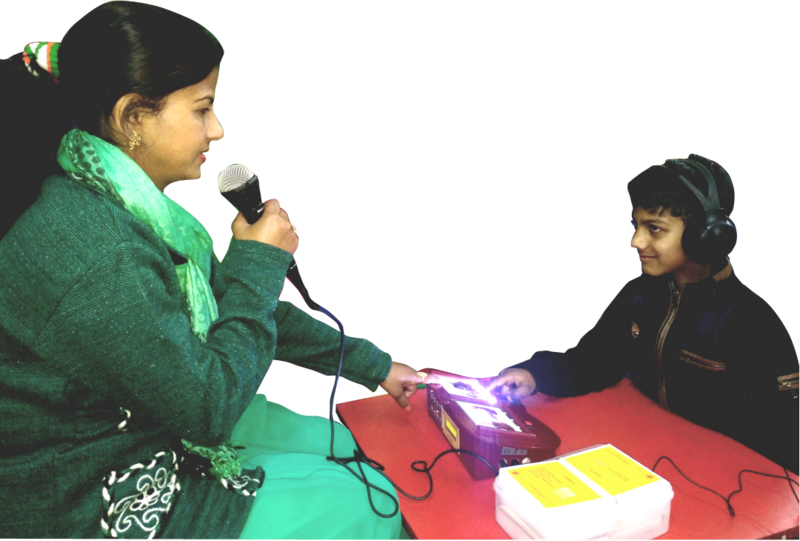 Drspectra provides advanced technology based treatment for Delayed Speech and Language problem. Where detailed evaluation of DSL is done by using advanced device and standard performa. After that parents are suggested the best solution Speechifi device under guidance of professional for improving receptive and expressive speaking skills of child with delayed speech and language problem. Treatment is given with complete services along with the speechifi device. The team of professionals works for rapid improvement in behavioral, social, non-verbal and verbal receptive and expressive language skill of child. Regular monitoring progress of child and setting goals and task for home are highly helpful in fast speech and language development in short duration. How is Speechifi device effective in delayed speech and language problem? Yes speechify device is very effective in all delayed speech and language cases. Delay of speech and language gap can be filled with regular use of Speechifi device. Success rate is 90-95%. 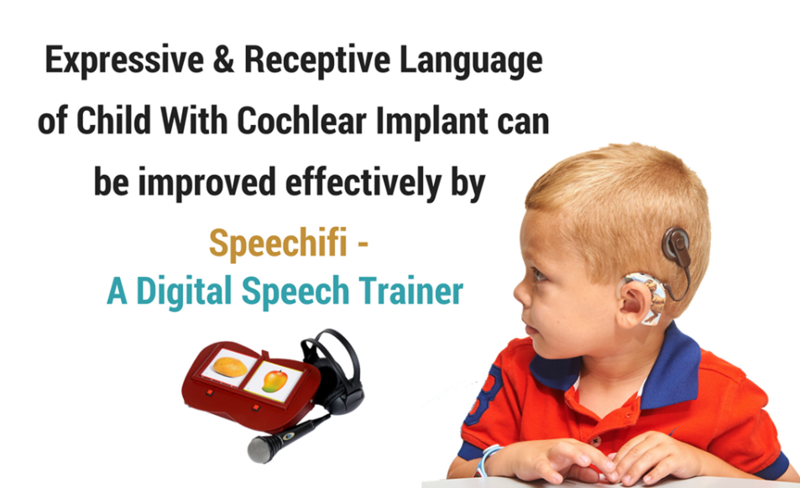 It is helpful in social interaction, behavioral development of child, discrimination and recognition ability, understanding simple and complex commands and overall all preschooler development can be achieved with extensive use of speechify device under Drspectra team guidance. 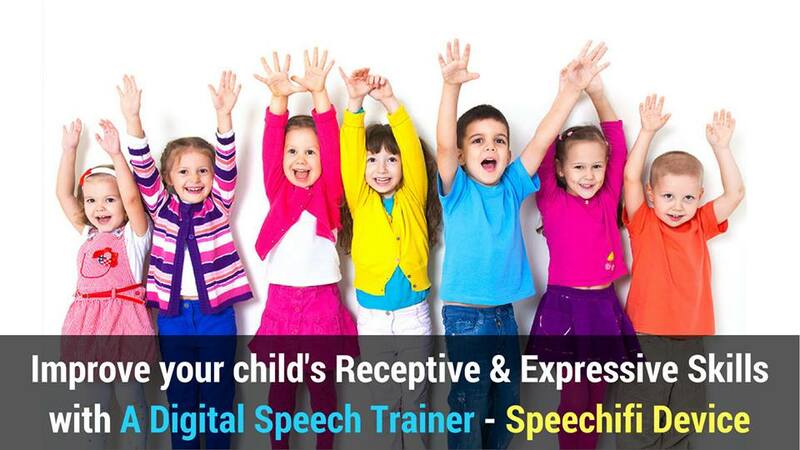 Speechify device is a multimodality based equipment which is provided with full of guidance of professionals and also complete speech and language development training to parents. Device is combined with auditory, visual and tactile modality that directly works on speech and language areas of brain that result in fast speedy improvement in receptive and expressive language skill of child in short duration. Treatment duration is 3-6 month. Is speechifi useful for all problem? Most of the speech and language disorder have components of delayed speech and language. They all need intensive speech and language stimulation at right age. They need familiar environment and multimodality based stimulation to understand and express their feeling. 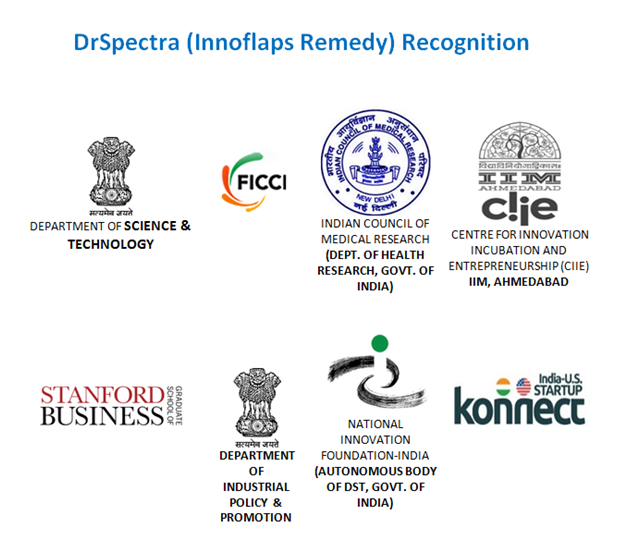 Drspectra considers all aspects for speedy improvement in child. Thus speechifi device is providing all aspects for fast speech and language development in child at their appropriate age. Do I have to visit clinic daily for therapy? No, you need to visit first time for assessment and training. After this, we give device for home. You need to use device at home for 30 minute a day. Drspectra do follow-up via phone or video call. This is not given any visual feedback to self correction and boosting confidence or no material to tie the patient to keep on practice for months. So chance is high to drop out practice. Please bring to your appointment any available medical records.